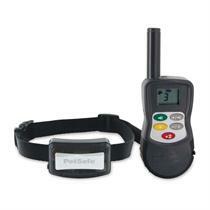 At the push of a button, the remote sends a signal, activating your dogs receiver collar from up to 400 yards away. The collar delivers a safe, gentle static correction. Your dog will quickly learn the association between his behavior and the correction. The Elite Little Dog Remote Trainer is a reliable, versatile, easy-to-use tool to help you train your dog off-leash.